Writers are neither revolutionist nor a martyr. Great Poets left us with real description of war. Many died in combat in the old wars. Their poetry was longing for home and the beautiful valleys of youth. Best honor for a writer. Have more Poesy written because of their words. This poem is for my favorite Poet Dryden. His words will never be forgotten. I tell the young writers. Never be a naysayer to a up and coming writer. We need more word-man and word-woman. A real Poet love the word. Written with skill or not. Words written from the heart. We need to read with a kind heart. Thank you Sue. A old one. One of my favorite. when you cant help but write and because the pain of not writing the word suffocates, taking away the breath of the author until the poet has no choice but to give the word life so the writer can live another day. Sometimes poetry hurts so bad as the words are sharp like knives but mostly the word is love embraced and expressed, shared. I agree. I have been writing for 50 years. Keep me sane. I agree and I liked your thoughts. Great write and true to itself. Keep writing, brother: we need more poems and less wars. I agree. More kind words and less hateful. Thank you for reading and the comment. I do appreciate. Such a beautiful thought.. any poet, when writes, writes from the heart.It should be appreciated and encouraged. I guess all writers are an empath to a certain extent when they feel the moment so deeply and let their ink flow in it. I had written something on the similar lines about what does writing mean to a writer. Take a look, if you are interested. I will read now dear Megha. Thank you for reading and the comment. John Dryden ancient story and words ensure. The Poesy could never be forgotten. Thank you Ladyfi for reading and the comment. I do appreciate. You are very kind. I appreciate the comment. I like Dryden! And I love the kindness you emphasize. Thanks. k.
Dryden and Ben Jonson. Both my examples of true wordsmiths. Thank you for reading and the comment. Your Poems, your way fo writing is so beautiful. Simple, soothing yet so impactful. I have really enjoyed visiting your blog today. I’m not familiar with John Dryden’s poetry, but your wonderful poem has made me very intrigued to check out his work. I like the way you said “True Poets dodge the fakeness of fame. John Dryden, Ben Jonson(Called father of the great Poets of 1500)and Donne. These are my favorites. If you read them. You will find the modern words we write today. Without Dryden bad attitude. Writing would of been stopped. A old photo. 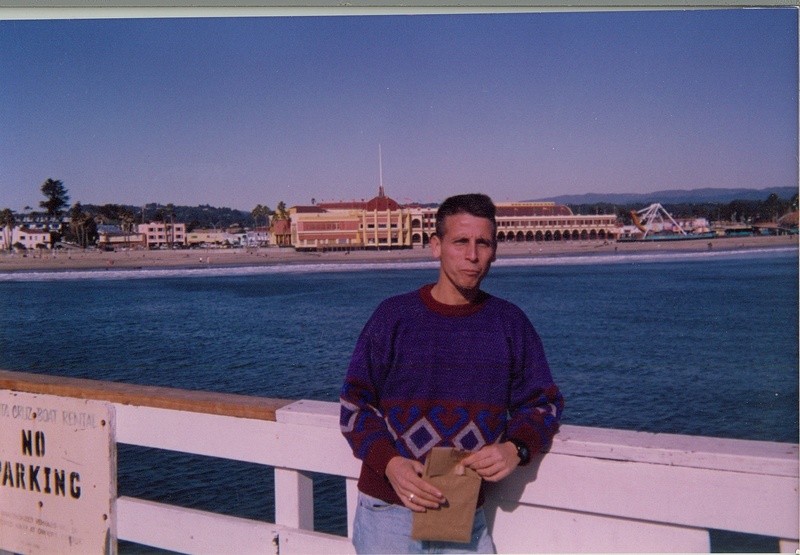 I was in Santa Cruz, California in 1994. I need a year on the California coastline today. thanks for dropping by my blog and sharing the love, i appreciate it. hope you liked it as I do your side of things. have a good one . I enjoyed your work and good to have found your site. Cheers back to you. One of my favorites. Need more Poesy and less violence. Thank you for reading and the comment. Thank you Chissy for the reblogged. You’re so welcome, I love how you write and express a story and this one about poets was bang on. Kudos. Thank you Simona. I wish you a fun and safe weekend. I’m glad and I appreciate the kind words. So many commented, I suspect it’s the spirit of Dryden living within you if you found it, John. Some lines in there prove it. I’ll try to read him later. Thank you. John Dryden is one of my favorites. Donne, Ben Jonson and Dryden. My teachers. Kosinski, Heming and London too. Thank you Monica. I appreciate the comment. Thank you. We need more poesy. Thank you Lynda. John Dryden gave me some positive motivation for this one. He create the word Poesy over 500 years ago. Great poem. “A empty journey leave nothing for the pen and the paper.” Appreciated this line. It started wonderfully and you kept it up throughout. Thank you for reading and the comment. John Dryden gave me the will to write this one. I liked how he defined writing. Wonderfully conceived and written. Kudos! Thank you. Mr. Dryden gave me the will to write this one. This is a good one, I loved it. Keep writing. Cheers! Mr. John Dryden gave me reasons to write this one. Thank you for reading and the comment. Being from Costa Rica and relatively new to poetry, I hadn’t studied him much. Thanks for the tip. John Dryden, Ben Jonson and Donne. Ancient poets and writers. Their words will expand your thoughts on writing. The last 4 lines are perfect. Ground breaking. Thank you Tara. John Dryden book gave me reasons write this poem. “We need to read with a kind heart.” I wrote poetry as a young child, but quit for 25 years. Your words are encouraging as I stumble through beginning again. Thank you. I’m glad. I have needed writing. Kept me sane in hard times. I hope to read your work. Thank you Katherine for the reblogged and the kind words. I do appreciate. Thank you Hugh. I appreciate the comment. Thank you. Poetry and writing. Words can be multi-layered. The poets of older days are blessings to those of us struggling now. I like the idea of not focusing on fame, but on the words. Important to remember this in today’s social media days where fame is its own goal. Very true John, writing is a space to learn emotionally what we can miss by walking through life, with our heads down. It has helped me cope with overpowering emotions that I wouldn’t have been able to make sense of without the pen. I’ll have to read Dryden. Dryden and Jack London “When Gods laugh”. I recommend. Made me write a 100 poem and many stories.Thank you for reading and the comment. Dryden gave me some motivation. The ancient writers believed in the power of words. Thank you Caro for reading and the positive comment. I shall take some time till I go in details on your blog. Shall stay connected and hope the same from you. And yes, I often find some good (at least I think they are ) liking and following my blog. This makes me wonder what could such a creative mind find interesting enough to follow mine. Not compulsory, but would like to hear from you (genuine feedback about my writing). your site. I believe we must understand our world. Must read and observe. Yes, we must understand. But sometimes the brain starts baffling if loaded with so much of information. It happens with me. And then I just stop looking outward and stick to inward, to remain balanced. The greatest challenge for me has always been not to lose sight of deeper self, while living and enjoying the outward journey. I will take your wise poetic advice on board. Thank you for crafting and sharing those elegant lines with an amateur like me. John Dryden taught me the word Poesy. We must expand the good word and story to other. Thank you for reading and the comment. Very good. Poetry, like any art, makes life more beaitiful, and bearable. You are right Dana. We need music, art and good book to make life bearable.Thank you for reading. Yes we DO need more poets in this world, so write! This is so beautiful and heartfelt. You are right John, we need more poets in this world. John Dryden said this many moons ago. People who read and write. They understand the world around them. Thank you for reading and the re-blog. I don’t know if we writers really understand the world around us, but it does help squelch The Dark Thoughts. I believe the more we read and listen. The better we can understand our world. Yes – we definitely need more word-men and word-women! Would be a better world if we had people who wrote and thought before action. There are good and bad to every action. Need to know both. Thank you for reading and the comment. Thought-filled words are always worth reading, John! Thank you for reading and the comment. The great writer Dryden gave me the positive motivation to write. Thank you. Dryden, the great writer gave me the motivation to write. Wonderful writing, and I couldn’t agree more. The world is in desperate need of feeling, something writing has in spades. I couldn’t imagine life without poetry, to me, they are one and the same. I agree. We need good books, poetry and music. I have 700 poem on WordPress. A lot to be read. Thank you for reading and the comment.I do appreciate. Thank you for stopping by and reading. I do appreciate. Hey! Thank you for following my blog. Thank you for reading and stopping by. I do appreciate. I enjoyed your blog also. Glad to find another person who loves Dryden’s poetry ! I got lucky. At a book sale I found a copy of “The best of Dryden” for a dollar. A 1933 edition. I have read the book twice this year. He gave me motivation to write 50 new poems. Glag to meet you. Another book I found was a 1911 edition of Jack London “When gods laugh”. Another fantastic book. Thank you. Mr. Dryden was a wise writer. He told the writers 500 years ago. Observe and write. History cannot be forgotten. one of the finest poem here. i read all the thoughts i have myself. I borrow a few lines from my favorite writer “Dryden”. He knew what a writer should be. 500 years ago. Thank you for reading and the comment. Thank you, Coyote, for following my wandering blog. You have awakened an interest in Dryden for me and we want the same things, especially for the young and the generations to come. I will meander through your ideas. Awareness for now – and progress soon, I hope. John Dryden was a great writer. He knew the real reasons for why we should write. Thank you for visiting my blog and thank for this, I really needed to read it today. I look forward to reading more of your words. Thank you for reading and the comment. John Dryden knew 500 years ago. We need writers and poets. I loved this one. Very powerful. I wanted to stop by and show my support and encouragement. To also thank you in person on your page for reading my blog and stopping by. Great work…and very inspiring! Thank you for stopping by. I need to write. Keeps my old mind alert and alive. Writing is a great way to keep alert…let it flow let it flow! The writers of the past held passion and desire for understanding above all. We need to copy them. I am happy your read this old literature.. we have so much to learn. Greek Mythology and forwarding writers are on my menu.always and on my mind . I am a very romantic dreamer in my writings.. Have a nice day. But not copy only to learn and try to use their manner and their picture of life and all what that mean.Also their proper use of language and words. thanks for being here. What a lovely poem! As a poet myself (although perhaps not a very good one) I’m so happy that Dryden was able to express that peculiar joy which springs from a love of language so much more beautifully than I ever could have. Thank you for sharing this poem! Dryden is one of the greats. I recommend Jack London “When gods laugh.” This book is why we write. To leave knowledge and wisdom for the future generation. Thank you for reading and the comment. “We need to read with a kind heart.” I ask God to give me that sort of heart often. Thank you for your visits and follow. Dryden knew 500 years ago. Words can have great power. Thank you for reading and the comment. I have been reading some Dryden. His books are true books for thoughts. His words are 500 years old and have the same meaning today. Thank you for reading and the comment. I can’t stop reading this! love this!! Love it! You’re a true poet describing the reality of other poets. I learn from the ancient Poets like Dryden and Neruda. Words are needed. Without writers. There would be no past or history. Thank you for reading and the comment. “A empty journey leave nothing for the pen and the paper. Those were some words I borrowed and re-wrote from Dryden. He wrote these words over 500 years ago. Thank you for reading and the comment. Read words from the heart with a kind heart – I love this. Thank you. Mr. Dryden gave me great motivation. The great writers of the past foretold the future with their words. Thank You for sharing the beautiful poem. It is truly inspiring and hope for a new beginners. I read the ancient writers. The Jack London, Milton and Dryden can lead us to good places and thoughts. Dryden was my motivation for this poem. Thank you for reading and the kind words. Will read the poems of The Jack London and Dryden. I have so much to learn and thanks once again for sharing. The ancient writers are beautiful. My favorite old poet is W.H. Auden. Have you ever read any of his stuff? I need to. I read some his work in poetry book of the best writers. Never his collection. I will research him. Thank you. I had read the new and ancient writers. We take from both and hope we can save or improve a life somehow. Thank you for reading and the comment. What a magnificent vision of the poet. Your words have a timeless wisdom about them. Certainly, and perhaps most importantly, you have inspired me. Thank you for this. Jack London book “When God laugh” gave me some positive motivation. Thank you for reading and the comment. Thank you Audrey. You are very kind. Like most people. I had to learn the hard way. Kindness and love is the cornerstone of life. Yes, we’ve all walked the harder path at some point. Coming through to the other side is a relief. I still have a lot to learn. “A real Poet love the word. All of us need positive words. You never know who may be the next great writer or words that could save us from ourselves. . True very true. Words written by others have saved me multiple times. Thanks! this is an amazing poem about poets John, I so feel like that about them (us? – I don’t really dare to call myself poet even though I try writing poems). You are a Poet. When we write and express words. Allow us to tell and show the world a better place. Thank you for reading and the comment. thanks for calling me a poet. Thank you the nomination. I will check it out. Thank you for reading and the comment. Poesy is a good word. Can lead us to many places and thoughts. Your Blog is awesome it reaches many. I have nominated you for this awesome award. Thank you. Thank you for the nomination. I will check out award later. My daughter is my expert on organizing my site. Thank you. I appreciate the award. Tomorrow I research and post. My job is killing me. Working in retail and the holidays. Too much work. And people like me cant…. I want to hire five people. Can’t find anyone who desire to work. USA people rather live on welfare than work for a living. There are jobs in Michigan. Indeed John, we write because we love the words.. we write because we need…. Mr. Dryden was a wise man. Good to write the poesy for the future. Maybe someone will pay attention. This is unrelated, but I noticed you were following my blog over at crawfordwritingblog.com – I wanted to let you know that I’ve switched it from a wordpress.com site to a wordpress.org site, which means if you want to keep following my blog, could you kindly go over there and click the new follow button? Thank you Jacqui for reading and the comment. “War, our consumption, was their gainful trade.” Got it in one. No-one notices (but all accept) that the war-mongers never go off to war themselves? Are we doing something wrong here, do you think? You are right. President Johnson made profit off the war in Vietnam. That is why he is the forgotten President. I did meet people with a degree and great ability in the military. War is the base of the USA. We spend for contractors. Close to 500 billion dollars for equipment. Add payroll, VA hospitals, pensions and disability. Over a trillion dollar for the cost of war. This is sad. Thank you. I enjoyed your site also. It is good we can wander around and learn from each other. Good to meet you. Dryden like many saw the future and the past. I wish the kids of today learn. The great word and thoughts are repeated. It is good to learn from the ancient writers. They can teach us many positive lessons. Thank you for reading and the amazing comment. The human race hasn’t really changed much, even though technology has changed significantly, and language has changed, too. But still, people do the same things. You are right. I read two of his books last month. Different countries. Same problems. World did not change much. Later this month. I will regain some energy. I just finished my inventory at work. I would enjoy writing with you. Nice one! And, should the sun rise in the west I’ll let you know. I hope not. We would be in trouble. Thank you for reading and the comment. Love this poem and the words are so true. Thank you for sharing. Thank you for reading and the comment. I was reading the old writers Dryden. Gave me the motivation to write the poem. Thank you for reading and following my work. Beautiful writing here! Than you Ana for reading and the comment. I agree. Let’s not write for fame. Let’s write because there is something to write about. Your poem is just beautiful! Dryden knew 500 years ago. Writer need to write. We need writers to ensure history is not forgotten and we hope someone learn from past mistakes. Thank you for reader and the comment. I do think that death and poverty and suffering have something to do with it. To be a great writer. You must live. Reading books and being a observer leave you empty. The great writers saw war and knew poverty. Few great writers came from the mouth of wealth. Hemingway, Kosinski, Twain, Helen Jackson and Nevil Schute live through hard times and left us with a realistic story of time and life. One of my favorite writers years ago wrote.Dryden said set the example. Write the truth and don’t be afraid of the consequences. You have a great voice within the formation of the page. http://ncbek.wordpress.com – check me out! Thank you reading and I will stop by. Thank you for the like on my blog, John, and by doing so giving me the chance to read your blog. Wonderful encouraging poem for poets from all kind of ages! Thank you Francina for reading and the comment. Writers must assist each other. Purpose of a writer. To tell the world the truth and lead the world away from war. It is too bad no-one listen to the war time writers like Hemingway and Shute. There is no real honor or beauty in war. A writer writes to express. A writer writes to show. But a writer should never write to show off. Old wisdom is still true today. Thank you for reading and the comment. Dryden told writers almost 500 years ago. Write to tell the truth, to create laughter and tears and try to lead people to a better places. I believe this should be the goal of a writer. Thank you for reading and the comment. Old writers need to motivate young writers to hope and dream. Thank you for reading and the comment. Hello, I have really enjoyed reading your blog! I followed. Thank you for reading and the comment. Need more writers and thinkers, maybe the world would be a better place. We would listen more and discuss with a open mind and heart. Absolutely. Starting my new concept of ‘Thirty days of Listening’ for precisely this same reason. Feel free to do the same if you would like. What you’ve said is true, thanks for saying it. I tried to write and read daily. Keep me sane. I believe reading, writing and learning something new daily give us strength in mind and heart. Yes because people write what they mean, but often say what they presume others want them to hear. It is always good to learn and grow. Me too. For the sake of my children and all children. We cannot allow the madmen to kill the hope and beauty of life. Thank you for reading and the comment. Wow! You write amazing poetry. I have only just started writing and loving putting thought & experiences down. Thank you for introducing me and many others to your talent. Thank. Writers are always learning. If we are lucky. We improve with time and age. Thank you for reading and the comment. Thank you. I will choose three tonight. Keep tilting at those windmills, John, this is good stuff. Thank you for the kind words. I have been reading the ancient writers. Making my poetry become better. I hope. I would be honored. Your site is amazing. Need more places for writers and poets to share their work. We’d be honoured to have you a part of this. Thank you so much! thanks for liking so many of my poems back to back! You are a very good writer. I enjoy reading your work and I tried to write when I can. I enjoy WordPress. So many good writers. Thanks again! I will keep trying to get things feelings out. It has been good for me this summer to find time and space to write again. I read this with a kind heard, I left your poem with a kinder heart. Thank you. Thank you for brilliant poetry!!!! Thank you reading and the comment. I read his collection in one day. He is amazing. If you can find. The best of Dryden. I read up on him. They said he was the writer who made the English language come alive. He even complimented the French writings. Greetings from Southampton, and thanks for liking my little film. Your like led me to look at your site, and this poem was the one that drew me first. Looking forward to reading more. “We need more word-man and word-woman.” I couldn’t agree more with you. This piece is very touching, like everything you write. Thank you! Thank you Eva. People who love the word. Understand life and the real purpose of life. Peace. Thank you MaryRose. Dryden gave me some positive reasons to write reasons today. Thank you for reading and the comment.